Travel and sewing are both passions of mine so when I’m able to combine the two loves, I take advantage of every opportunity. Today I’m returning from two weeks in Tokyo. Who could miss the many Japanese women who travel halfway around the world to attend the many quilt shows we have in the U.S.? I was quite sure I’d find many fiber arts related in this quilter’s paradise to occupy my time. There’s nothing like a trip to inspire my next BERNINA creation! 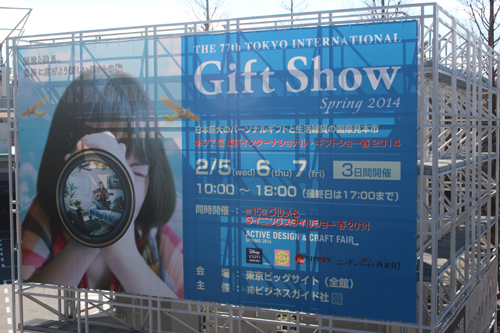 I began by attending the giant Tokyo Gift Show. We spent the day looking at the many items available to merchants. 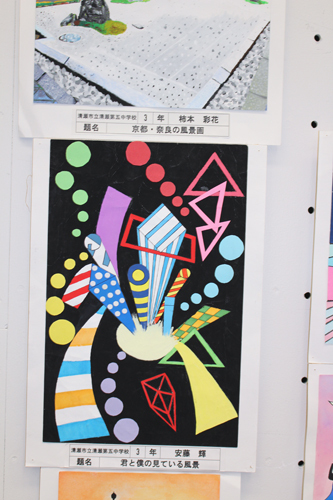 I especially loved the “Anime-Comic and Character” and the “Modern Japanese Style” sections of the show. What girl doesn’t like to shop? 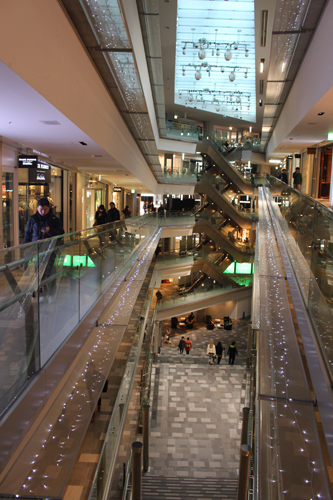 The enormous shopping malls in Tokyo are beyond anything I’ve ever seen. Imagine 10-12 story department stores, filled with mini-boutiques within. I discovered that frequently the top stories are devoted to books, fabric, and arts and crafts supplies, so I began my shopping at the top and worked my way down. There were beautifully crafted items for sale at mini-boutiques throughout the store. It was heavenly to find so many unusual items to look at! I have always loved fashion and I was especially charmed by the contrast in styles. Businessmen were immaculately groomed with suits, ties and often very stylish (though uncomfortable looking) pointy dress shoes. Women were attired in so many different styles. From the beautiful silk kimonos (yes, they’re still worn today), to high fashion, high end designer wear, it was such a contrast in fashion looks. Very trendy teenagers sometimes dressed in a funky, street style consisting of petticoats, short dresses, thick eyelashes, pouty lips, and bangs which made for a wide-eyed look that reminded me of the cartoonish Manga characters. There were school age children in adorable uniforms complete with pleated skirts, knee socks and sweaters for the girls to knee socks, shorts and tailored jackets and cute hats for the little boys. Each school had their own smart-looking uniforms for their students’ attire. It was fun to just sit and observe. It’s a great place to “people-watch”! I went to some absolutely inspiring museums in Tokyo. The 21 21 Design Sight, an experimental design museum in Roppongi, was created by one of my favorite designers, Issey Miyake. 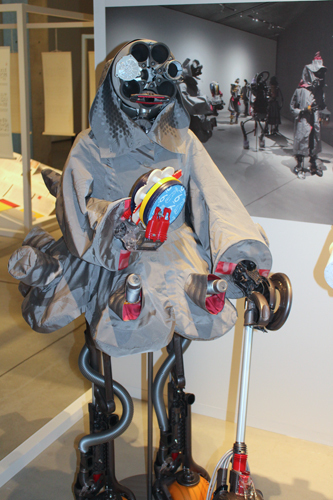 There were displays showing how his designs are created along with crazy, artsy exhibits of his works I’d never seen. The building was built by the Japanese architect Tadao Ando and was worth seeing in its own right. The Amuse Museum, a textile arts museum in Asakusa, featured beautiful antique kimonos and exhibits of real-life garments with traditional Japanese aesthetics. And along the way we bumped into other inspiring exhibitions. When we visited the Tokyo Metropolitan Art Museum in Ueno to see a view of over 150 bonsai masterpieces, we came upon an incredible gallery exhibit of whimsical children’s art with enormous potential for inspiring future fabric creations. And no vacation would be complete without fabric shopping. Nippori Fabric Town was a several-block area filled with multi-level fabric stores. 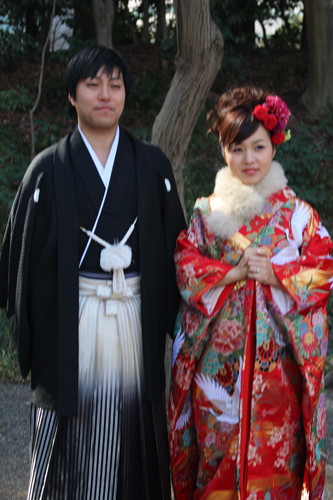 You could find kimono fabrics, beautiful silks, furs, leathers, incredible ribbon and beaded trims. A true feast for the eyes. 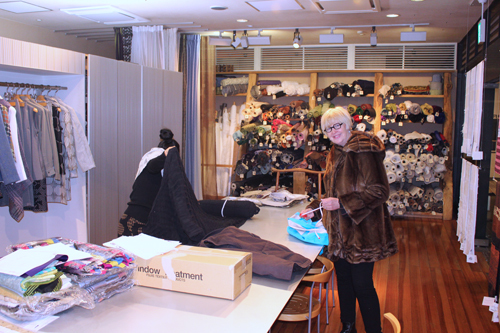 Hands down my all-time favorite fabric store in Tokyo was Nuno, in the AXIS Design Centre in Roppongi. Nuno creates a unique line of fabrics combining traditional ideas with the latest technology, resulting in fabrics that are truly revolutionary. Prices are steep, but these fabrics are extraordinary. I purchased three amazing pieces. 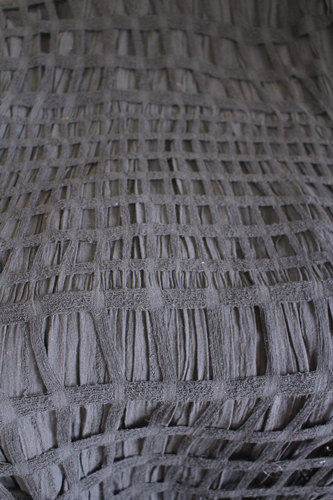 One is a black lattice-like stretchy fabric, layered over a pleated linen-like fabric. Another is a stunning, artsy reversible with black circles embossed on a black background on one side and striped circles on the other. The third piece is a white ribbon-like woven piece. They’re impossible to describe to do them justice…partially because I’ve never seen fabrics like these before! Today is my first day home. My treasures are laid out to look at and appreciate. My head is filled with new ideas and inspiration and my trusty BERNINA sewing machine is beckoning me. I can hardly wait to sit down and begin sewing! Diane Gloystein is a BERNINA Ambassador and a National Educator representing Sulky of America, and recently co-authored the book Embellish Your Life with Sulky with Joyce Drexler. 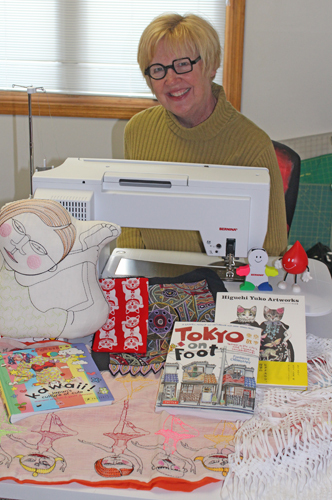 She can’t imagine life without her BERNINA 830, which makes all creative ideas possible! Visit her at Design on a Whim. Next Next post: Quick Question: What Do You Use to Read BERNINA E-Mail?